The predictive moving average indicators are designed to calculate the price required on the next bar in order for the market and a moving average, or two moving averages, to meet and potentially cross. The predictive moving average indicators employ three of the most popular moving averages found in TradeStation. In addition to predicting the target price required for the market/moving average to meet the indicator can also be used to identify the bullish/bearish status of the market as the indicator changes color based upon the moving average trend. There are two predictive moving average indicators included in the set. The first indicator calculates at what price the market and a moving average will meet. The second indicator calculates the price required by the market in order for two moving averages to meet. In addition the indicator also calculates the price both moving averages will met at. When using the predictive moving average indicator to identify at what price two moving averages will meet traders can combine any of the three moving averages included. This TradeStation indicator offers traders who employ moving averages as part of their trading the ability to anticipate the likelihood of the market and moving averages crossing and plan in advance. The indicator can also be inserted into a TradeStation Radarscreen to monitor the market and where it is trading in relation to a potential cross over. The indicator can be used to scan and identify markets where the trend has changed and the market/moving average has crossed or to identify markets in a long term bullish/bearish trend. The screenshot below shows the predictive moving average indicator applied to a TradeStation chart. The indicator calculates and plots the target price required for the market and the moving average to meet on the next bar. The AMZN chart below shows the predictive moving average indicator changing color to alert to the fact that the market has closed at the target price. Looking at the data window you can see the market closes at the target price, calculated on the previous bar, and as predicted the close meets the moving average on this bar. The predictive moving average indicator includes the option to apply trend coloring to the indicator to easily see when the market is trading above or below the moving average. The CSCO chart below shows the predictive moving average x2 indicator changing color to alert to the fact that the market has closed at the target price required for the two moving averages to meet. Looking at the data window you can see the market has closed at the target price and as a result both moving averages have closed at the same price. The predictive moving average x2 indicator also includes the option to apply trend coloring to the indicator. In this case the color changes based upon if the first moving average is trading above or below the second moving average. Click to view all predictive moving average indicator screenshots. The predictive moving average indicator includes the same settings found in the regular TradeStation moving average indicators so you can set the price and length of the moving averages you wish to monitor. You can also set proximity alerts and cross over alerts so that you can be notified when the market and the moving averages are getting close to crossing and when they have crossed. When applied to a RadarScreen the predictive moving average indicator provides additional information. The indicator also includes the option to change the color of the information displayed in RadarScreen based upon the prevailing trend. Price Target - displays the price at which the market and the moving average will meet. 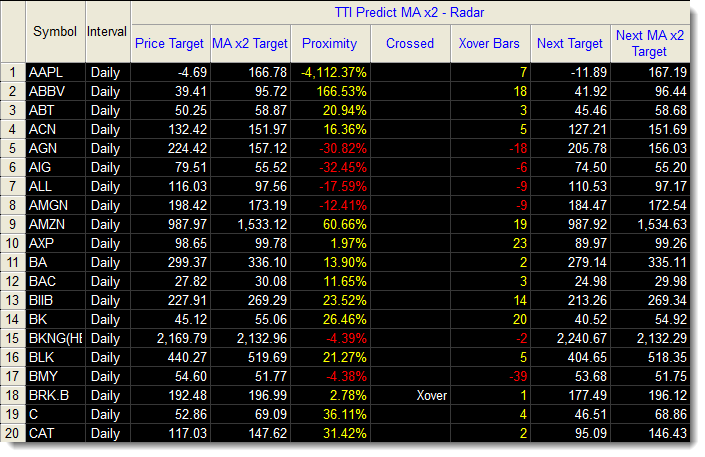 Proximity - shows how far the market is away from the predicted price target as a percentage. Crossed - alerts that price has crossed the moving average on this bar by displaying a text message in the column. Xover Bars - displays the number of bars since price last crossed the moving average. Next Target - displays the price at which the market and the moving average will meet on the next bar. The predictive moving average indicator applied to a RadarScreen. A RadarScreen version of the predictive moving average x2 indicator is also included. Price Target - displays the price required for the two moving average to meet. MA x2 Target - displays the price at which the two moving averages will meet. 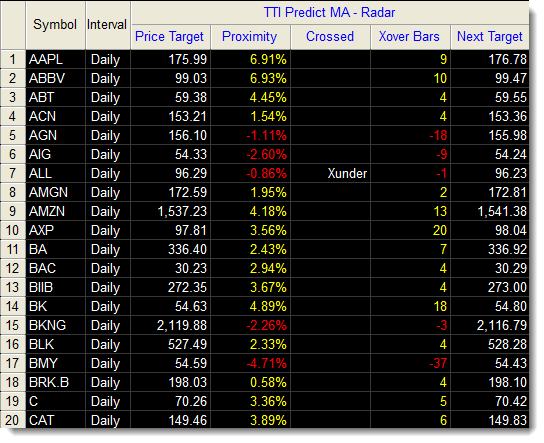 Crossed - alerts that the two moving averages have crossed on this bar by displaying a text message in the column. Xover Bars - displays the number of bars since the two moving averages last crossed. Next Target - displays the price target required for the two moving averages to meet on the next bar. Next MA x2 Target - displays the price at which the two moving averages will meet on the next bar. The predictive moving average x2 indicator applied to a RadarScreen. Click the button below to add the Predictive Moving Average Indicators for TradeStation to your wish list.